Actually, let me expound upon that a bit more. The dough is magical, in more ways than just flavor and structure. I’ve talked briefly about Jeff Hertzberg and Zoë François’ Artisan Bread in Five Minutes a Day. Their theory is simple: amazing homemade bread can be made with just minutes of work for each loaf. No kneading required. 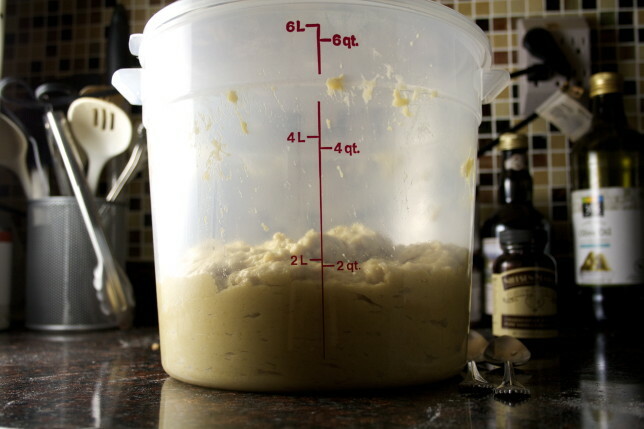 Enough dough is mixed in a large dough bucket for several loaves, or even more donuts, and just pulled out whenever you want it, usually within two weeks, or five days for an enriched dough like brioche. That means you can take as much or as little as you want for whatever you’re making. This recipe yields 12 donuts, but you can easily pull out and shape even less dough if you’re frying for two. The book has changed my life. 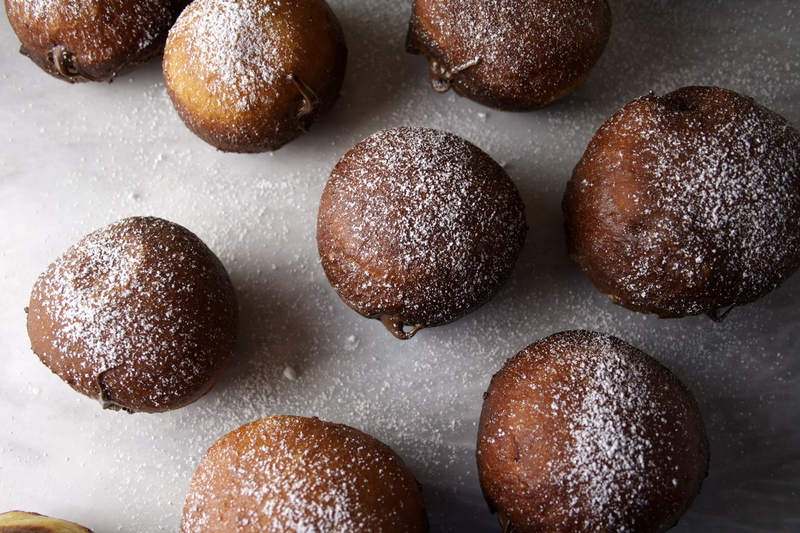 And these beauties have changed my outlook on fried donuts forever. They’re not cloyingly sweet, like so many out there. They’re sophisticated. 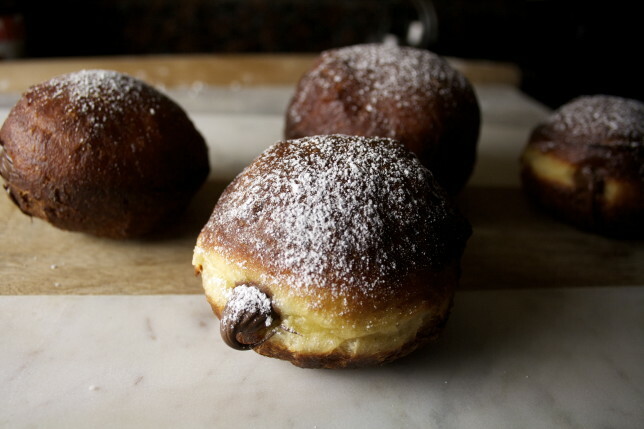 They may not be true sufganiyot thanks to the Nutella, but they warmed my family’s hearts and filled their bellies with lasting love — love that burns for more than eight nights. 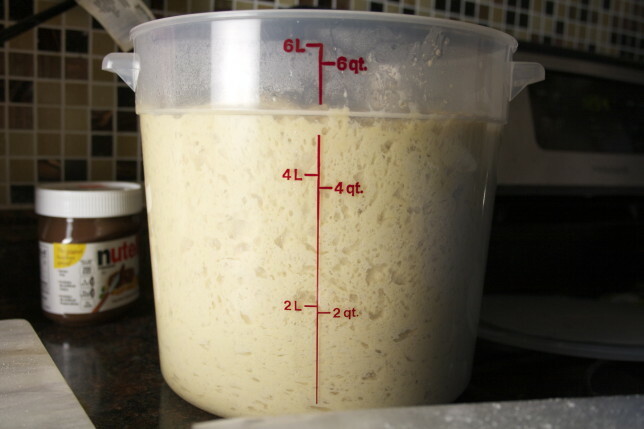 As mentioned above, take out as much or as little dough as you want. A pound and a half was perfect for six of us. I’m planning on taking out about half of that for my next batch, and will update with leftover results — if there are any. 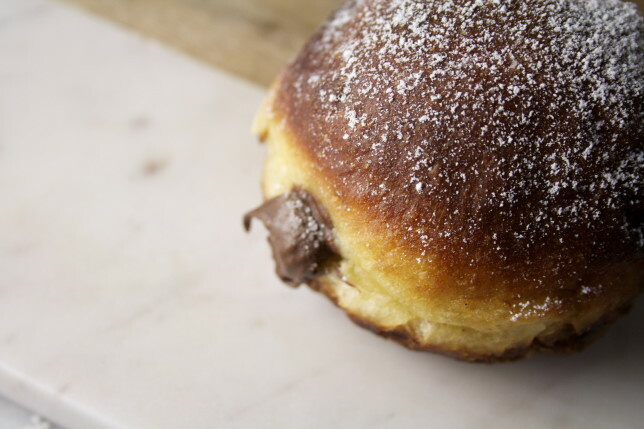 Definitely check out Artisan Bread in Five’s website for tips on making, storing, and shaping the dough, and more ideas on what to make with the rest of your brioche dough. And remember: calibrate your thermometer. I was wondering why my first batch was cooking so quickly at what my thermometer said was the proper temperature, resulting in a very raw center, before I remembered that I had had this problem before. My sweet spot on my thermometer was 350, because it’s about 15 degrees off. Learn from my mistake! 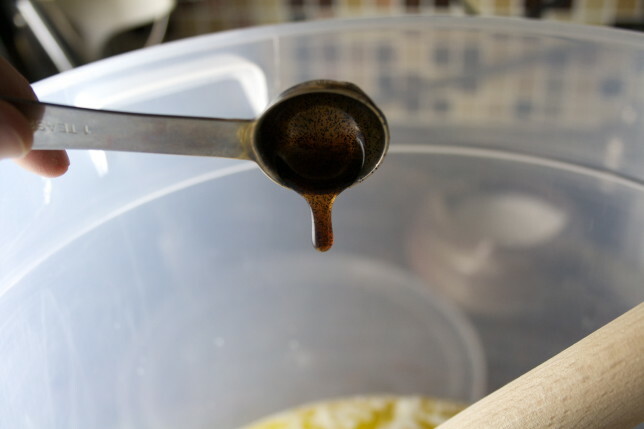 In a 6-quart dough bucket or very large bowl, mix the yeast, salt, eggs, honey, melted butter, vanilla, and water. Add the flour and mix thoroughly. Make sure there are no patches of flour and everything is incorporated evenly, though some lumps in this dough are okay. A Danish dough whisk comes in handy here. The dough will be very wet and slightly sticky. Cover loosely with a lid or with a clean dish towel and allow to rise at room temperature until doubled in size, about two hours. Place in the refrigerator for at least three hours, or preferably overnight. (The dough can be made and stored in the fridge for up to five days). Remove the dough from the fridge, dust the top with flour and cut off a 1 ½-pound piece (about the size of a small cantaloupe). 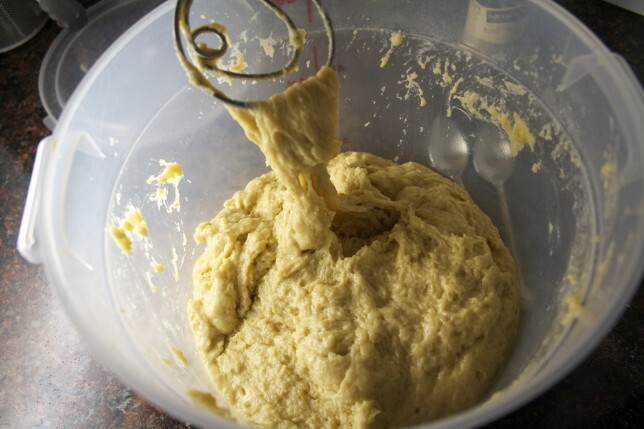 Dust the piece of dough with more flour and quickly shape it into a ball, stretching the surface of the dough around to the bottom, rotating the dough a quart of a turn in your hands as you go. 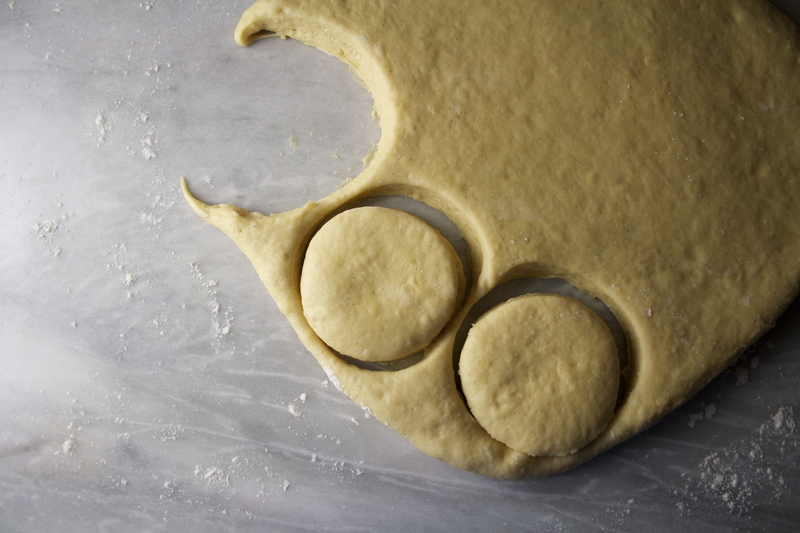 Place the dough on a lightly floured work surface and roll out to about a ½-inch thickness, using a bit more flour if it begins to stick (but err on the side of less). Using a 3-inch biscuit cutter, cut the dough into about 12 rounds, smushing together the scraps and re-rolling as necessary. Place the rounds on a lined and lightly floured baking sheet and allow to rest for 15-20 minutes. In the meantime, heat about 3 inches of oil in a pot or dutch oven until it reaches 360-370 degrees Fahrenheit. A candy thermometer works wonders here if you don’t have a deep fryer. Gently place 3 donuts in the oil once it’s reached the proper temperature — it’s important not to crowd them. Cook for about 1 ½ to 2 minutes, then flip and cook for another 1 ½ to 2 minutes. Remove each donut with a slotted spoon and place on paper towels to drain. Repeat with the remaining donuts. 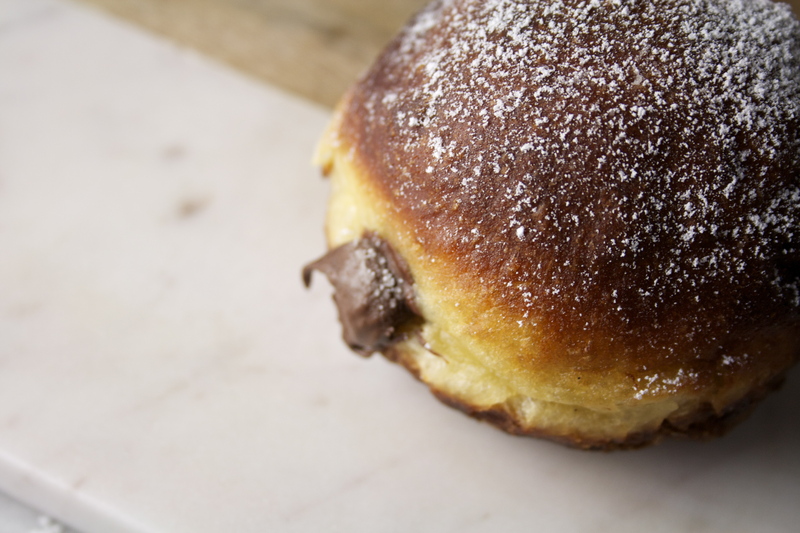 Heat the Nutella in the microwave for about 15-20 seconds to make it a more amenable consistency for filling. Add the cocoa powder and stir until fully incorporated. Using a paring knife (or a dowel-shaped knife sharpener), cut a small hole in the side of the donut, extending into it to make room for the filling, making sure not to go all the way through. 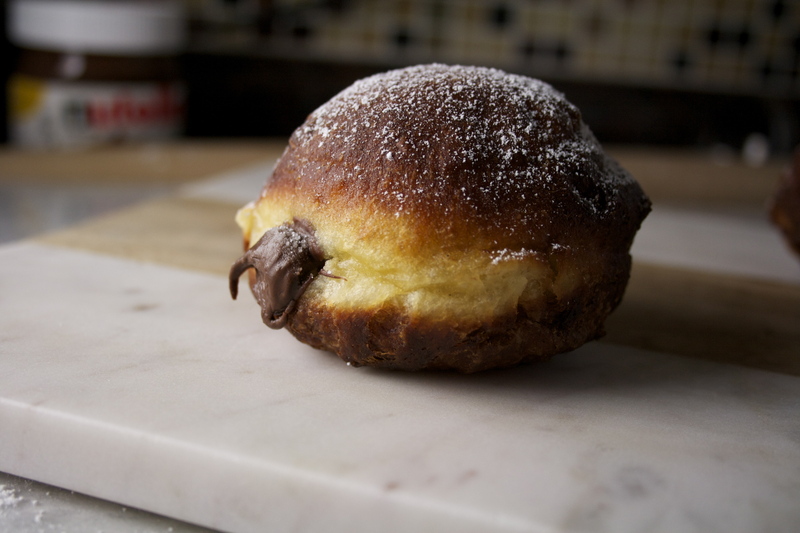 Spoon the Nutella into a pastry bag or a plastic bag with the corner cut off, and pipe about 1 tablespoon of Nutella into each donut. Dust with powdered sugar and serve.